My sister is a very down-to earth, modest, caring and intelligent person. She is a graduate from a top London University with a First Class intercalated Bsc degree as well as her MBBS qualifications. Currently she is working as a Registrar in a London based hospital having graduated with her MRCP qualifications. Although ambitious, she is not career obsessed and would always put family first. She has a great sense of humour and loves spending time with family and friends to unwind. She also loves travelling and hopes to explore more of the world in the future. In terms of religion she is God fearing, practises the five pillars (she always endeavours to perform her 5 daily prayers on time) and she dresses modestly, observing the headscarf. 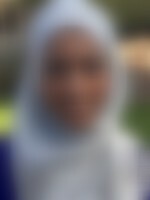 She wishes to expand on her Islamic Knowledge and become a better Muslim alongside her life partner. We live in a family with moderate values. Her father has passed away while her mother is a homemaker. She has one brother, who is married, and 4 sisters out of which 3 are married.